Spooky Nook Sports of Manheim, Pennsylvania signed a development agreement with the City of Hamilton on October 24 to move forward with plans for the former Champion Paper Mill site. Once completed, Spooky Nook Champion Mill will be the second largest convention center space in the Tri-State area and the largest indoor sports complex in North America. A groundbreaking ceremony for the development was held on Thursday, October 25. The adaptive reuse of the former Champion Paper Mill has been at the forefront of most Hamiltonians’ minds since the Mill began to shed operations in the early 2000s. For many, jobs at Champion Paper Mill brought their families to settle in Hamilton, and in some cases it employed multiple generations of family members during its 100+ years of operation. The challenge of reactivating a 40+ acre brownfield site while honoring its rich history has taken many years of close collaboration and problem solving. 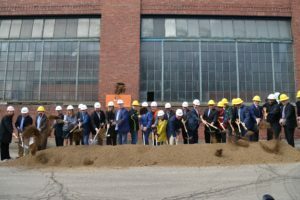 Through many partnerships, including a $4.7 million Ohio Historic Preservation Tax Credit grant, and other creative funding sources, the project is now shovel-ready. Spooky Nook positions Hamilton to attract and grow the Tri-State’s billion dollar tourism industry. In 2017, Spooky Nook’s Pennsylvania location welcomed more than one million visitors. According to a report by Tourism Economics, this traffic brought an additional $39 million in off-site spending to the surrounding business community in 2017 alone. It is expected that the business community surrounding the future Hamilton location will see similar impacts. While many Hamilton businesses are expected to benefit from the extra tourism Spooky Nook will generate, this development will also bring amenities to enhance the lives of residents across the region. In addition to accessibility of innovative health and wellness programs, the development will likely spur additional hospitality-oriented business investments such as new restaurants, retailers, and other entertainment options.